Following a study where cadets from Lucknow Platoon were given pace counters to record their movements it was found that they, on average, walked for over four miles each day between medical and physio appointments. Clearly this did little to help the recovery of those with lower limb injuries. 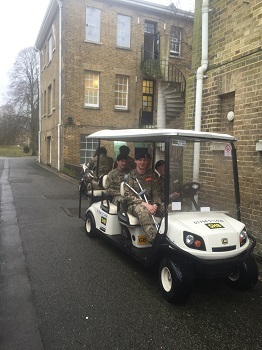 The Trust therefore stepped in and provided a six-seat golf buggy to ferry injured cadets around the academy.